Home Personal Finance Are Meal Subscription Plans Worth the Cost? If you’re looking for easy lunch and dinner alternatives, you may have already considered getting a meal subscription–a plan offering meal ‘credits’ at a fixed cost, which can be used at select restaurants nationwide. But before making the jump–are these plans really as convenient and cost effective as they seem? We’ve evaluated Singapore’s subscription plans to identify how they truly measure up to more traditional options. While meal subscription services aren’t necessarily new to Singapore, only two plans stand out as widely accessible and price competitive. MealPal, a global subscription service, offers lunch and dinner plans where customers can pick amongst certain meals at certain restaurants and apply credits–at a fixed rate–as a kind of payment. 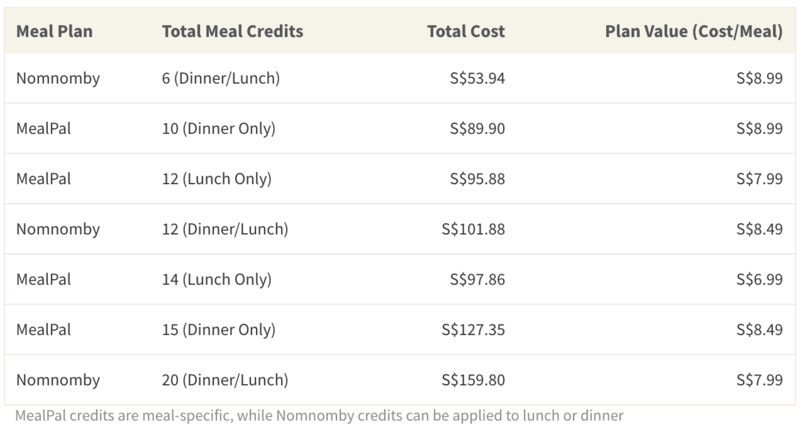 Nomnomby, its closest competitor, follows a similar structure but is limited to Singaporeans. In both cases, customers pay a flat fee upfront and receive meal credits, which can be redeemed without additional payment to the selected restaurants. This flat fee translates to an average ‘value per meal,’ as shown below. These plans provide individual meal costs that are generally lower than the average market cost, which also make them an attractive alternative to services like Deliveroo and UberEATS. However, there’s no delivery option–customers must pick up their own orders. All things considered, meal subscription plans seem like a cheap and easy way to get your lunch and dinner–but is this always the case? One of the biggest factors influencing value is actually your personal preference–in fact, your choices determine whether you’ll save or lose money on your plan. In order to maximise value, you’ll need to ‘optimise’ which restaurants, cuisines, and dishes you choose from a limited offering. Overall, this may or may not align with what you’re craving. To further explain, your choices are immediately limited. MealPal and Nomnomby work with a network of partnering restaurants to decide which dishes to offer each day. This means you won’t get to just choose your favorite restaurant, or even pick from a restaurant’s menu. Restaurants have the ability to ‘push’ items that are less popular (or that they need to get rid of) and can limit selection to cheap-to-make dishes. 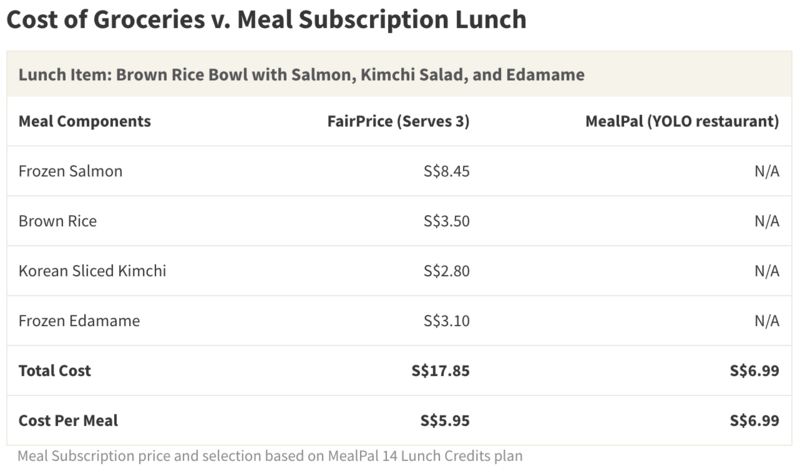 Even more, they actually have the right to decrease portion size for meal plan subscribers. Value, then, is driven by your familiarity with restaurants and you dietary preferences. MealPal and Nomnomby partner with a wide variety of restaurants which vary across overall quality, meal complexity and standard menu pricing. If you’re dining-savvy, you may know which restaurants are more expensive or have better reputations–but for the rest of us, it might be hard to weed through the 100’s of options laid out with little context. This also applies to cuisine and dish selection. More complex options tend to be more expensive on both levels, and choosing complex meals can more than double your value. On the other hand, if you’re a simple eater or a vegetarian, you may actually end up losing value. This is because several plan restaurants actually offer menu items whose standard price is lower than the fixed rate you pay for each meal credit. In addition, less-picky eaters in congested areas can save money by eating at food courts or hawker centres, where meals often only cost S$2–S$5. The value of meal subscription plans also depend on your grocery shopping and cooking habits. Somewhat surprisingly, eating at home isn’t always the cheapest option. First of all, both convenience and time factor into cost. While meal pick-up requires travel, so does home cooking. The time taken to go to the supermarket and back–in addition to shopping–quickly adds up. Even more time intensive is cooking itself–especially if you prefer to make smaller batches and prefer to avoid leftovers. Considering the average value per hour, which we discuss further below, cooking at home can suddenly become quite expensive. Cooking also requires buying groceries in ‘bulk’–like buying an entire head of cabbage just for a garnish. Matching the complexity of restaurant dishes would require buying a variety of expensive spices, sauces and more that you may not use again (or if so, quite sparingly). Buying in ‘bulk’ is also costly if the items quickly expire. Finally, home cooking can also be costly if you’re unskilled in the kitchen. Inexperience can result in greater food waste and produce food with lower quality (in other words, providing less fulfillment than the cost needed to make it). Overall, considering the cost of time, shopping and human behavior, home cooking isn’t always the most cost-effective option. While meal subscriptions can save money on several fronts, they’re actually not as convenient as you might think. As mentioned, MealPal and Nomnomby don’t offer delivery. This may not matter much if you work in a congested area with plenty of walkable restaurants, but those who rarely leave the office during the workday, tend to work extended hours, or simply work in a more remote area are definitely at a disadvantage. In addition, inconvenience is more than a passing frustration. Time has value–you can actually calculate the hourly value of your time by dividing your annual take-home salary by the hours you work each year (including your commute). Here’s an example for reference. The average salary in Singapore, as of 2019, is S$67,152/year. The average hours worked per week is 44.8 according to the Ministry of Manpower, and the average public transport commute is 84min/day. Taking into account public holidays, this calculates to about S$25.83 as the value per hour for the average Singaporean. Let’s consider the time it takes to pick up your meals. If your roundtrip (including drive and time to receive meal) takes about 30min, one work-week of dinner pick-ups runs to 2.5hrs! For the average Singaporean, this time is worth approximately S$65. This adds about S$13 ‘cost’ to each meal you pick up. At the same time, this ‘inconvenience’ may not come at such a cost if leaving work for meal pick-up actually brings you a sense of joy or respite. If this is the case, meal plans may actually seem a bit more attractive, providing additional value in their own unique way. Ultimately, meal subscription plans are likely to benefit those who are less experienced in the kitchen and want discounted, on-the-go meals. This fits the bill for many young working professionals, especially if they’re busy and on a budget. However, because meal credits can only be spent on weekdays, there’s still room to enjoy alternatives–like cooking at home or dining out with friends on weekends. Overall, it may be worth giving meal subscriptions a try to see how much value they add to your own life. The article Are Meal Subscription Plans Worth the Cost? originally appeared on ValueChampion.